Hey design lovers! 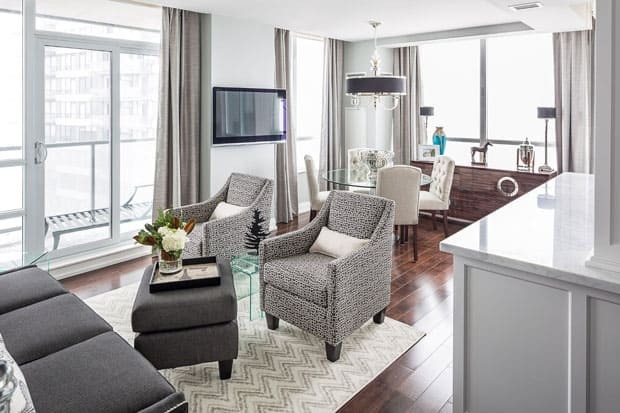 Have you ever thought about decorating with gray instead of the neutral palette of browns, beiges and taupes? 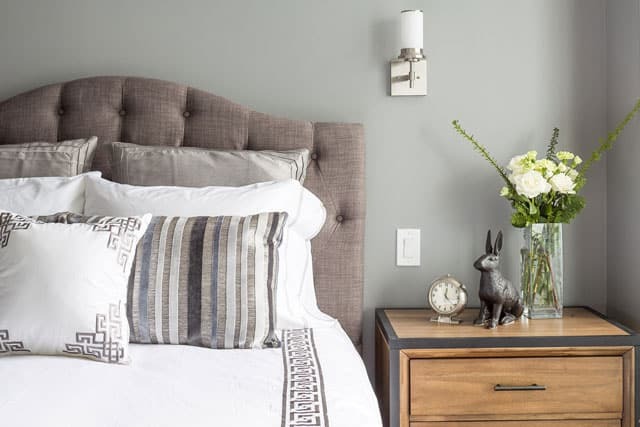 Gray is such a great alternative that can add a calm and soothing effect to your home. 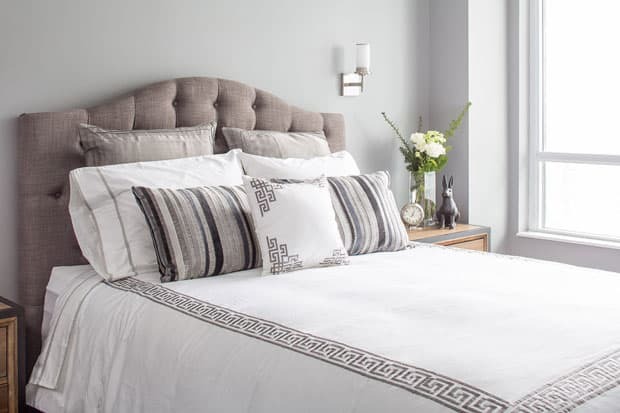 There are so many varieties of gray that you could go really subtle or make a bold statement, it blends so well with other colors too, like bright yellow or orange. 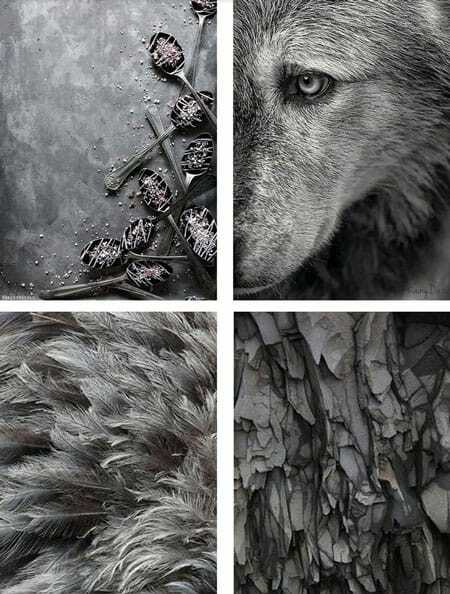 I have found some images from Pinterest that highlight the exquisite beauty of gray…. 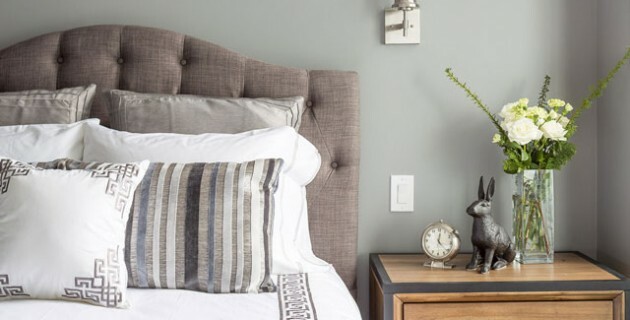 Just look at the awesome bold shades of gray seen in the images above, with textured layers and a tactile feel, this is a color you should have in your home! From tiles to feathers, papers and paintbrushes, these images tell a color story that is really appealing. The numerous tones and hues you can choose from the gray palette would give your home a handsome yet graceful look. 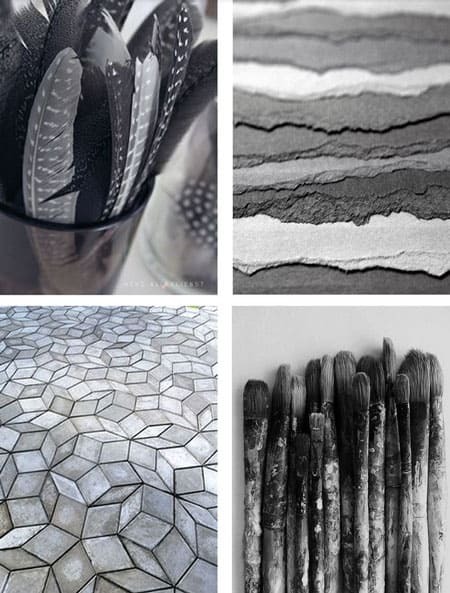 I love these images and they all came from my favorite Pinterest color board from Key Interior Designers. It’s my guilty pleasure to look through it every week! In this gorgeous living / dining room, Nicola Interiors combines traditional patterns and metallic details, with various textures. The richness of the chic grays contrasts with the dark wood floor and cabinet. The sophisticated fabrics add the right amount of flair, with a soft luxurious feeling. What a fantastic place with all of that natural light! I would love to have those colors in my home, it looks so stunning! 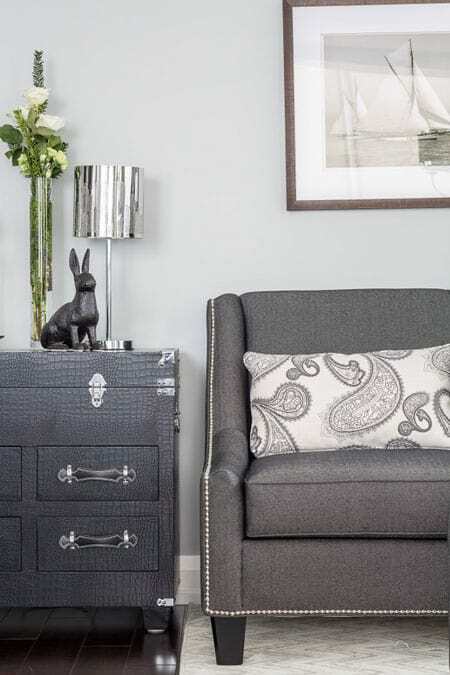 The dark leather chest is textured with metallic edges, it’s edgy look complementing the room's sophisticated gray walls and soft furnishings. 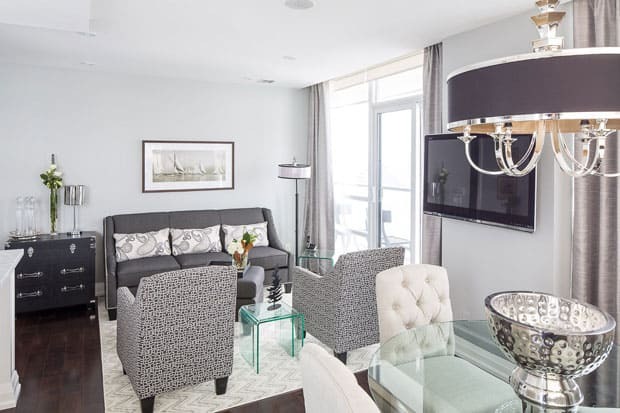 The metallic lamp and sofa trim complement the superb decor in this room. The lighter gray and white paisley patterned pillow, is a perfect match to the bolder darker shades of gray seen in the furniture and the other home decor accessories. I love the sculpted hare sitting on the drawers...where can I get one?! 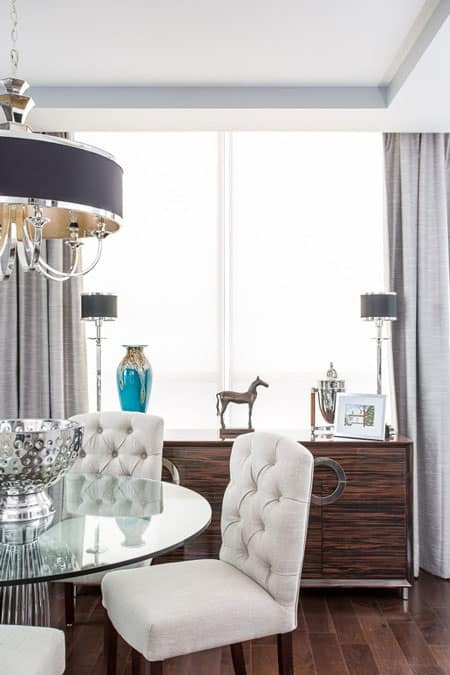 The dining room is swathed in handsome grays and beautiful fabrics. The dark wood floor and cabinet give such a solid contrast to the lighter gray tones. The silver accessories really make this room ‘pop’. The plush tufted dining chairs create a superior feeling of luxury, complemented by a glass-topped dining table. 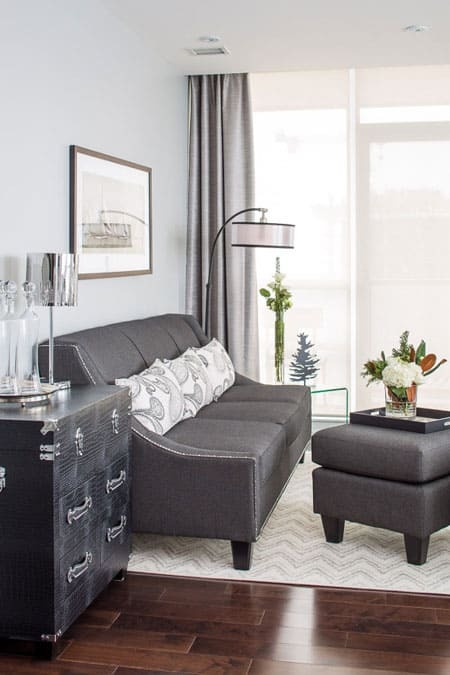 This is such a wonderful space, with many ideas for mixing your shades of gray! Finely woven drapes bring balance to this primarily gray room. The brushed texture and the color have a classic style and are soothing at the same time. The home decor accessories in this living room give subtle opulence when paired with the timeless gray shades. Metallic objects enhance the room's dazzling palette. I love how the designer has added subtle patterns into the room, that rug is just so pretty! 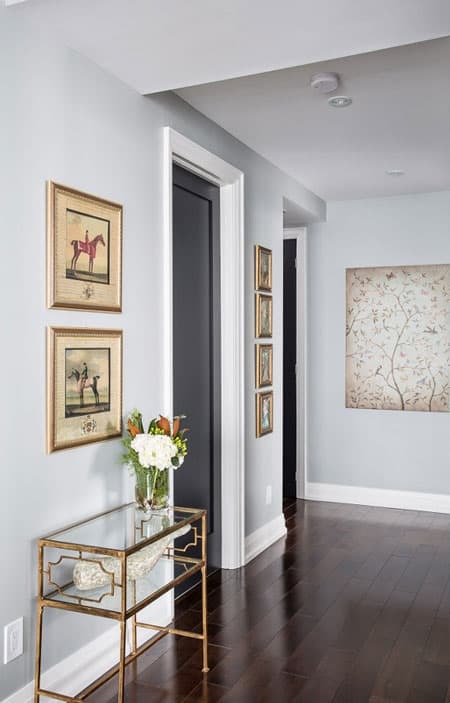 With the continued use of gray in this elegant hallway, the walls have been given a sophisticated palette of cool gray, enhanced by rich artwork in gold frames. The lovely gold and glass table paired with the floral artwork on the wall gives a Chinoiserie vibe. This subtle touch of glamour, would be sure to delight you every day! By adding patterned paisley pillows, this living room has a break from the block of dark gray. The pillows complement the lighter tones of the rug, drapes and wall art. This room has many shades of gray, that stand out while also blending in. The metallic details really do add a touch of luminosity. I love how this looks so chic and sophisticated, yet comfortable and livable at the same time! 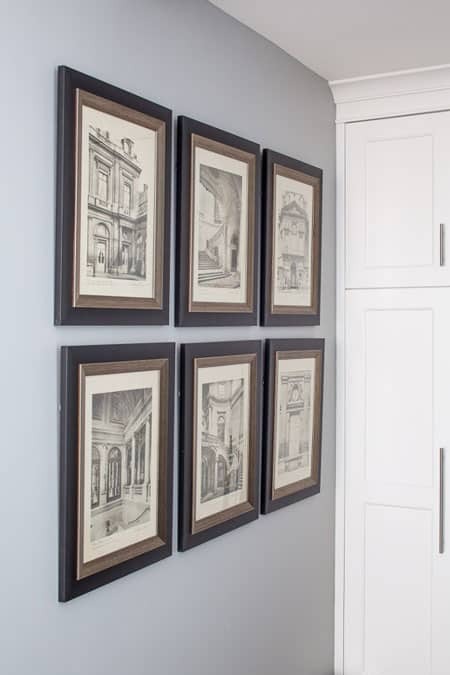 These neat frames contain artwork that looks like vintage architecture etchings. They are a great addition to this subtle gray wall. I love the style of these prints! The pattern on this bedding makes a profound impact without being overwhelming. By mixing patterns, textures and hues, this bedroom has a serene feeling. The pretty warm gray color of the walls sets the tone for the classic yet simple decoration in this lovely room. I would really love a bedroom like this, it looks relaxing and stylish - my friends would certainly be jealous!